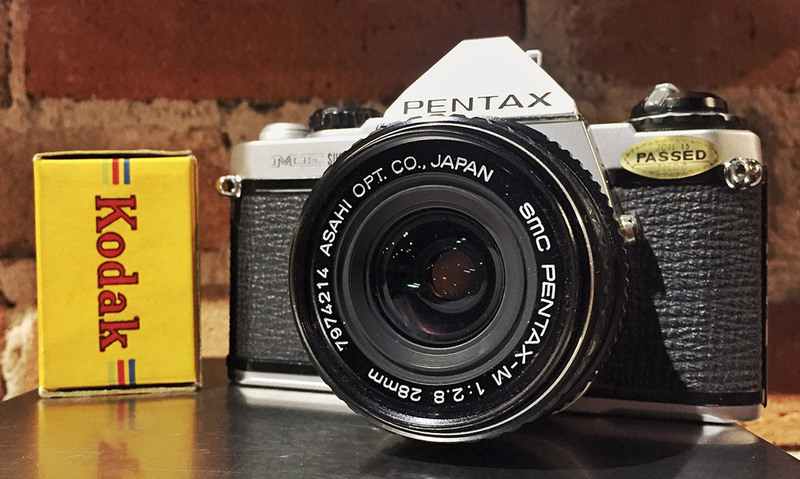 The title says it all: the Pentax ME Super is a full-size, full-featured 35mm SLR in the body of a much smaller camera. This one has a story to it, too. I couldn’t tell you the first time I saw the ME Super. I probably wasn’t old enough to know what it was even if I did remember. It was my dad’s camera. It wasn’t until I’d been using film almost exclusively for a couple of years that Dad finally decided to give me the camera. He hadn’t used it in years and wasn’t even sure it worked. He’s told me several times since about how he’d been using a Minolta Hi-Matic 9 (he thinks) for awhile, but a coworker had brought an ME Super along to a gypsum mine they were inspecting. Dad was impressed enough to tell my mom how cool the camera was when he got home. My mom, gift-giver extraordinaire, filed the excitement away in that way she has. Come Christmas, when Dad had all but forgotten about the Pentax, wouldn’t you know there was an ME Super under the tree. That was probably in about 1981. Most of my memories of the 1980s are shaded just a touch magenta, crystal clear and delightfully contrasty. Dad made them that way with his love of Kodachrome and that Pentax ME Super. 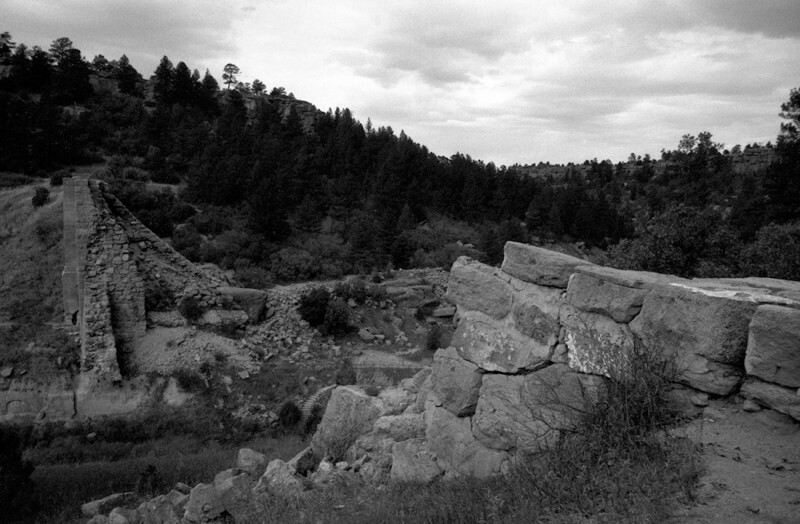 As I recalled in my EMULSIVE interview, one of the first times I remember being at all interested in photography was when my family drove up the highest paved road in North America and then walked the last hundred feet or so to the top of Mount Evans. He took most of the pictures, but he wanted to be in one, too. He showed me how to focus and trusted me with his Pentax (“It’s not a camera, it’s a Pentax.”) for the first time. I think I was 10 or 11. I don’t know where the slide is now. By then Dad wasn’t as diligent about loading them into carousels as he had been when I was a kid. But if I close my eyes I can still see Mom and my sister standing next to him through the viewfinder, the Front Range spread out thousands of feet below them, and the Great American Desert stretching hundreds of miles to the distant horizon. No picture can do the view from 14,000-plus-feet justice, of course. I was excited to be trusted with the camera again 25 years later, and better yet, it still works just fine. Dad gave me the body, an SMC Pentax-M 58mm f/2.0 lens, an SMC Pentax-M 28mm f/2.8 lens, and a Pentax AF160 flashgun. He had the original boxes for the flash and the 28mm, too. I also got all the manuals and warranty cards, and the receipts. Of course, Dad decided to keep the vintage pigskin camera bag his parents had given him, and I don’t blame him — it’s a pretty sweet bag. So let me tell you about the camera and the fun I’ve had with it. Like I said, the ME Super is a full-featured SLR. It’s got aperture-priority auto-exposure, but adds a manual mode that was lacking from its predecessor, the ME. It takes commonly-available batteries, and can function adequately without them. It can handle a huge variety of K-mount lenses. And it’s brilliantly compact. Size was obviously a a consideration from the get-go, too. 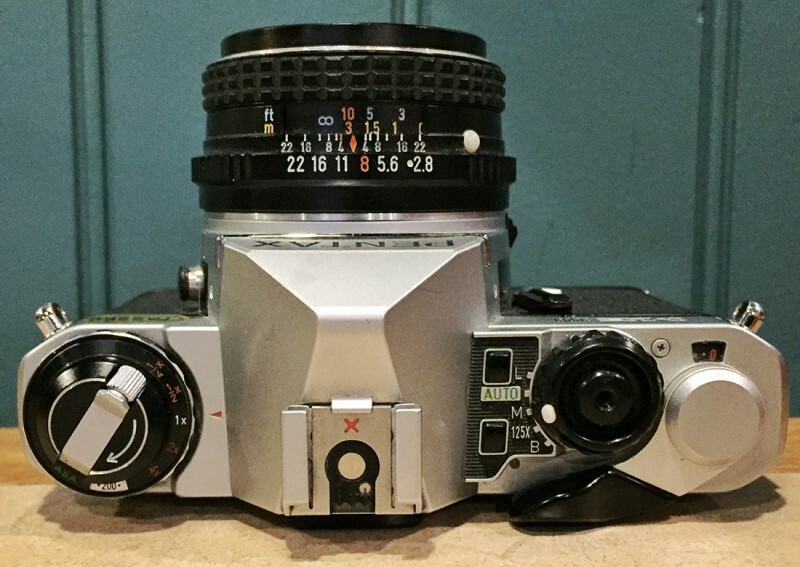 Olympus’ success with its compact OM-System bodies had other manufacturers taking notice, I think. Pentax introduced the small M-series cameras in 1976, and at the same time added the SMC Pentax-M line of compact lenses, making for one of the smallest and lightest SLR packages you could buy in the late 1970s or early 1980s. The body is metal — mostly aluminum — with a few plastic parts in places that make sense. It takes two LR44 batteries, which are still available in most any drug store. Controls are pretty much where you’d expect. Film loads in the usual way, although the ME Super has a spiffy film transport indicator on the back of the top plate, just below the advance lever. Three little fluorescent-orange lines wiggle in the indicator as long as the film is moving correctly. When you’re wasting the first two frames on a fresh roll of film, if the camera is set to Auto mode and the lens cap is on, the camera may try to make an extremely long exposure and lock up the mirror. The owner’s manual recommends quickly flipping the mode dial to the 125x setting and then back to cancel the exposure and release the mirror. The metal focal-plane shutter travels vertically and can go as slowly as 4 seconds, or as fast as 1/2000 of a second. In manual mode, the shutter speed is controlled by a pair of up and down buttons between the mode dial and the pentaprism housing. The mode dial can be set to Manual, Auto, 125x (shutter-sync speed, and a mechanical 1/125-second shutter setting you can use without batteries), Bulb (also works when the batteries are dead) or Lock. The shutter release button, threaded for a standard cable release, sits in the center of the mode dial. A small, white lock button on the mode dial must be depressed to turn the dial away from Auto, though it does not engage in any of the other settings. The film advance lever snaps out and lets you hook your thumb behind it, and a half-press of the shutter release turns on the meter and the LED display in the viewfinder. The half-press is a reliable battery check method unless the batteries are really dead. On the front of the camera, near the mode dial, is a self-timer that runs about 10 seconds. Pull it down all or part way to set the desired delay. If you go all the way down, you’ll have to give it a push in the upward direction to start it off. 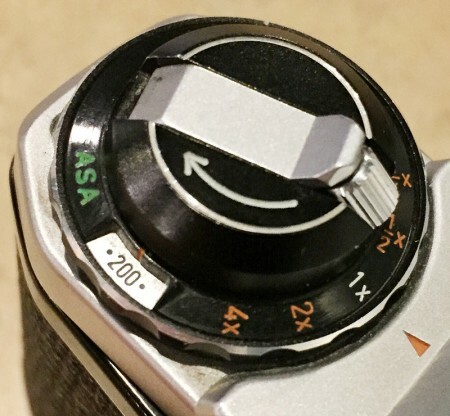 Be sure the shutter is cocked first — easy to see with the tiny shutter-ready indicator, a dot behind the mode dial that is orange if the camera has been cocked, and black otherwise. On the left-hand shoulder you’ll find the film speed dial, exposure compensation and rewind knob. Lift the ring and turn it to set film speed from ASA 12 to ASA 1600. Turn the knob without lifting to adjust exposure compensation from -2 to +2 stops in full-stop increments (though you can set the knob between detents for partial stops). Rewind knob is standard fare — flip out the crank handle to rewind (after depressing the spool-release button on the bottom plate) and pull up to open the film door. There’s a hot shoe on top of the pentaprism housing, and a PC Sync socket on the left side of the lens mount. Aside from the standard center pin in the hot shoe, a smaller second pin allows Pentax flashguns to automatically set the camera to flash-sync speed at 1/125 regardless of whether Auto mode is selected on the mode dial. A fully-automatic frame counter is visible just forward of the film advance lever. The lens mount is a Pentax K-mount, so you can use hundreds of Pentax lenses, as well as a vide variety of other makes including Cosina and Miranda. The lens release is a lever on the bottom-right of the lens mount; depress it toward the camera body and twist the lens to unlock the bayonet. The big, 0.95x-magnification viewfinder offers 92 percent coverage, so you can frame quite tightly and expect some breathing room. The focusing screen features a split-image center, surrounded by a microprism ring, in a ground glass field. The shutter speed indicator along the left-hand edge of the viewfinder uses a green or yellow LED to indicate the selected shutter speed in Manual mode and red Over/Under LEDs to indicate exposure. In auto mode, the LEDs will light next to the automatically-selected shutter speed; adjust until the desired speed is indicated (Over/Under illuminate only if a correct exposure isn’t possible with the selected aperture). Speeds of 1/60 second and faster have green LEDs; slower speeds have yellow LEDs to indicate that a tripod is suggested. An “LF” LED indicates that exposure compensation has been set to something other than 0; “M” indicates Manual mode is enabled. The meter does not activate at all in 125x mode. The gallium arsenide photodiode light meter is center-weighted and measures full-aperture through the lens, and works well all the way down to the slowest shutter speed — 4 seconds. On the bottom plate there’s a guide pin hole and contacts for an automatic winder attachment, with the film transport coupler hidden under a cap that looks similar to the battery cover (which is nearer the middle than the end — and marked “battery” in case my description isn’t obvious enough). The spool release and a standard 1/4-inch tripod mount round out the features underneath. This thing is pretty fantastic. It’s superbly compact, solid and sturdy, functional and effective. No complaints. Review over. Mic drop. Okay, it’s not that simple. I do have complaints, though they are minor. Overwhelmingly, I can say that this camera is, honestly, a great value. I can see why it impressed Dad enough for him to rave about it to Mom. The ME Super was made from 1979 to 1986, as far as I can tell, and appears to have sold very well all those years. As it is, you can find your own for a very reasonable price. The size is impressive. It’s considerably smaller than even other compact SLRs like the OM-System cameras or my Fujica ST605N. Setting the ME Super next to a Nikon F2 is kind of like parking a Honda Civic next to a Cadillac (except the doomed Catera). 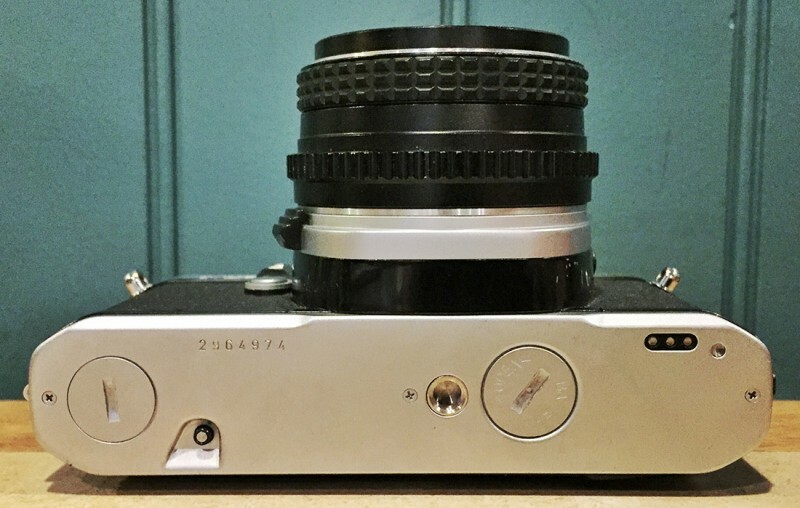 Despite the small frame, the ME Super is a metal workhorse camera, with stamped aluminum and steel exterior parts, and plenty of machined steel inside. It fits comfortably in the hand — even my massive mitts — and has the tangible rigidity, as well as the unmistakably deliberate polish and fluidity of a Nikon or Hasselblad. The weight, too, is impressive. Coupled with an SMC Pentax-M lens, the whole thing would fit in a jacket pocket or purse comfortably. The feature set is solid. It’s not a camera loaded with useless bells and whistles by any means. It has a solid auto-exposure mode and a very usable manual mode, wide range of film speeds and competitive exposure compensation, a really impressive viewfinder, and a few unobvious features that make perfect sense once you’ve seen them. Like the shutter-cocked indicator. Another good example is the film transport indicator. This little window with its three brilliant orange lines looks novel at first. Inside the camera, it’s coupled to the top of the take-up spool — which has a collar with a band of rubber around its middle, and which is turns independently of the spool. With film loaded correctly and advancing, friction between the rubber and the film cause the collar to turn, which makes the lines wobble back and forth. It can only work if there’s actually film in there, actually moving. The transport indicator is not a feature I’ve personally seen on any other camera, but it’s simple, mechanical, and eliminates a lot of guesswork about whether the film is moving. 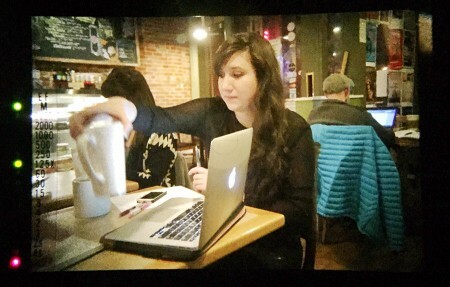 It’s also mesmerizing and fun to watch when you rewind your film really fast (which is plenty easy on this camera). Thinking about it, I suspect it could be especially useful when rewinding, since it would stop as soon as the full-width film had left the take-up spool, just before the trimmed leader portion pulled out. This would give you a reliable way to rewind your film while leaving the leader out for easy spooling on development reels. I did not actually give that a try, but I may have to in the future. I’m just too used to winding it all the way in and using a film cassette opener (which really works well). 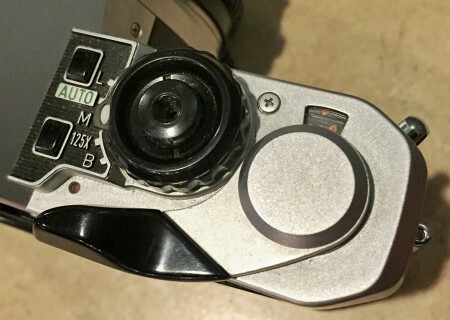 I’ve complained before about nonsensical decisions on the use of plastics in SLRs about the same age as this, and the ME Super has some plastic parts: the shutter release button, mode dial and shutter speed buttons. Fortunately, Pentax chose a plastic that’s solid and shiny, and doesn’t feel cheap it all. In fact, it feels comfortable and natural in the few places it’s used. All the controls operate smoothly and easily. The advance lever only travels about 100 degrees, making it easy to manually advance frames in startlingly rapid succession. It’s surprisingly quiet, too. There’s just the tiniest sound of mirror bounce when the shutter fires in the middle speeds, but even that is surprisingly quiet. Of course, after pumping several score rolls of film through the 6×7, even small-caliber howitzers don’t seem very loud. The shutter itself sounds tight and fast. 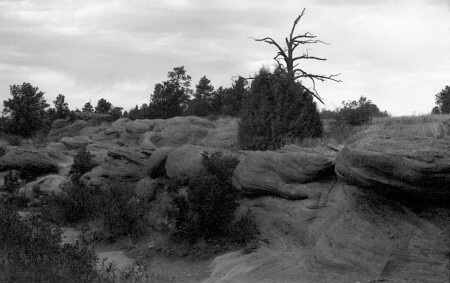 At 1/2000 second, it may even sound better than my Nikon FM2n. Maybe. Here’s where we get to a complaint, though. Probably my single biggest beef with the ME Super is the shutter speed controls. It’s not hard to operate them, really. Just tap or hold and watch the LEDs move in the viewfinder. But it’s not as satisfying as a mechanical knob with detents you can snap to without much thought, and without holding the camera up to your eye and looking at the readout in the viewfinder, you can’t see what the shutter is set to. My other complaints are similar in nature — not deal breakers, just a bit vexing. There’s no depth-of-field preview, for example — though I rarely use them anyway. You can’t see the aperture setting in the viewfinder, either. Others have complained about the lack of auto-exposure lock, but metering where you want and then transferring the auto-exposure settings to manual mode works just fine for me. And that about wraps up the drawbacks to the ME Super. Moving to the bottom of the camera, I don’t have a motor drive to test those features, but the spool release and tripod mount both work as advertised. The battery cover, too. And the batteries last forever. Actually, there were good batteries in it when Dad gave it to me, and they’re still there, plugging away. My best guess is they are at least 10 years old. The lens release lever could be more brilliant. Pressing it in toward the body is a somewhat unwelcome break from normal SLR lens mount options, though it works well enough. It seems to be designed so that, when holding the camera normally, you can use the third finger or pinky finger of your right hand to pull the lever in, and your left hand to rotate the lens. Lens releases are one of those things that each manufacturer has their own way of doing, and none are really bad. Just as I had to get used to Nikon’s lenses rotating the wrong way after using a Canon DSLR for years, I think this is an idiosyncrasy I’d get used to quickly with more use. The take-up spool is interesting. It has a dozen or so white rods standing next to each other around the spool, and the film leader must be slipped between two of them. It’s fairly brilliant from the perspective that you don’t have to nudge the film advance a couple times to find a good spot to wind on your leader — there’s always another slot. This isn’t a review of the lenses, but the SMC Pentax-M 28mm f/2.8 and 50mm f/2 are both very solid performers, as we’ve all come to expect from Pentax. 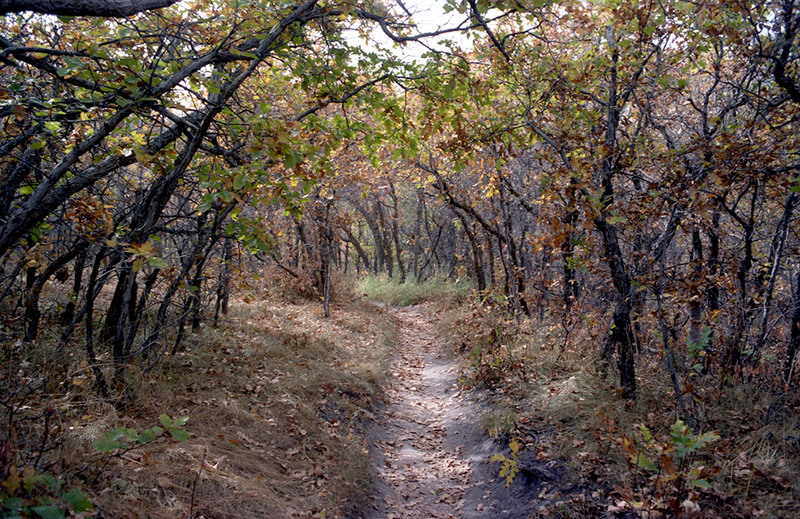 Little-to-no visible distortion or chromatic aberration is visible in images made with either one. They’re fairly sharp and exhibit excellent contrast. They’re not on a par with my 6×7 lenses, but for compact lenses, they’re a great value. So there you have it. It’s not perfect — but it’s darn close. Don’t miss a chance to try one out — I’m fairly confident you won’t be disappointed. 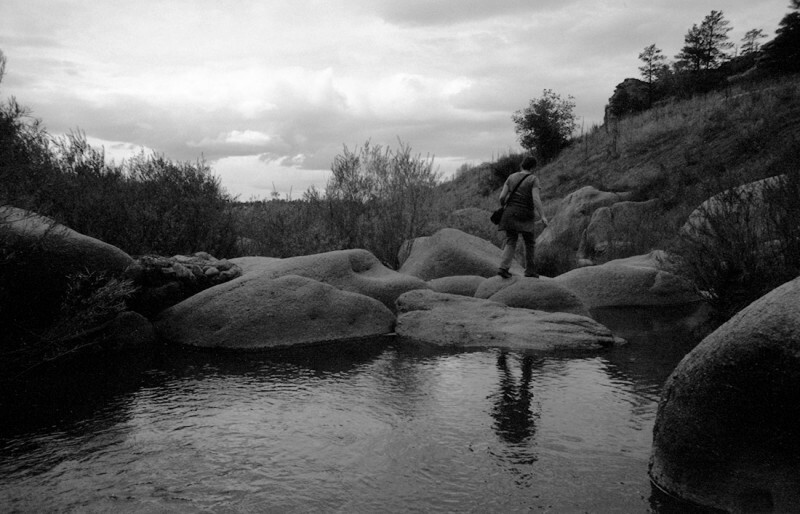 A note on the example photos: As much as I’ve enjoyed this camera, I still managed to underexpose my black-and-white example shots by a couple stops, and, apparently, overdevelop them. 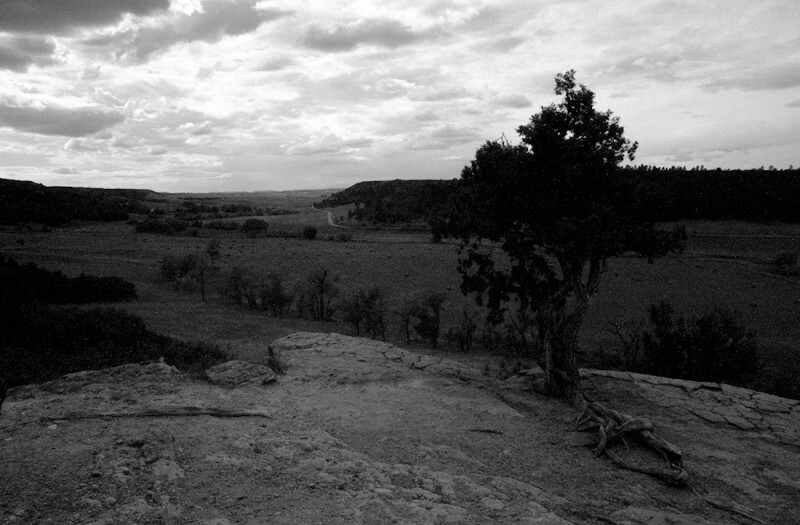 It was a heavily-clouded day, though, and I’m not totally unhappy with the gloomy look the photos have. 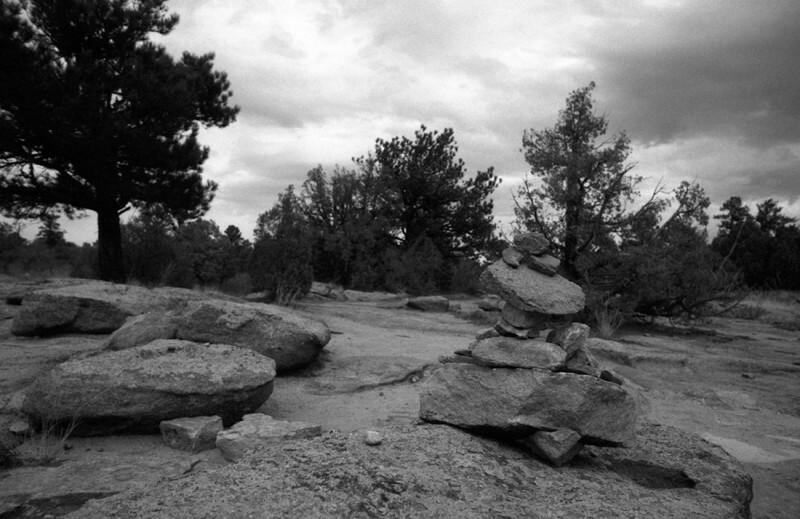 It’s on me — I went from ASA 200 color negative to ASA 50 black and white and back, but forgot to adjust the film speed on the camera in the middle. In addition, I seem to have lost one of my test rolls, which left me less options for examples than I’d intended. But I’m tired of waiting on this review (and so is Dad), so I’m hitting Publish. 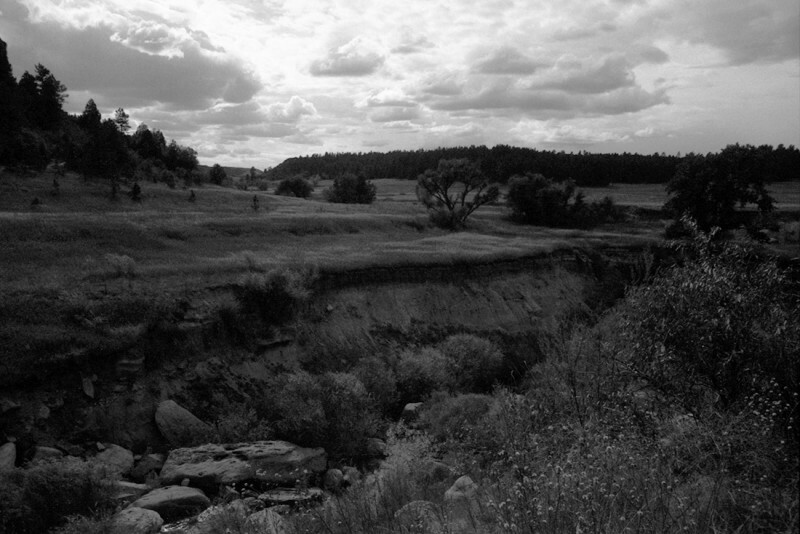 A note on the subject matter: Castlewood Canyon is a small, uneventful state park in many ways, but the story of the slapdash damming of Cherry Creek, and the resulting flood when the dam failed, is a fascinating one. Read more in Patty Horan’s “The Night the Dam Gave Way: A Diary of Personal Accounts,” (PDF) which includes construction history and historic news about the dam, a number of first-hand accounts of the flood, and numerous historic photos. Well worth the fifteen minutes. I also found a 1933 Associated Press story with the headline, “Dam break causes heavy loss in Denver,” which reported estimated damages of $1 million — nearly $20 million adjusted for inflation. The roar of water as the dam broke was reportedly heard as far as two miles away. A note on the Kodachrome: The roll of Kodachrome featured in the lead image above is unopened and was given to me by a new film photographer friend whom I met through the EMULSIVE Secret Santa. He told me it came from an unopened wedding gift given to a the parents of a friend of his when they were married around 1946. The box has an expiration date of 1949 marked on it, and a price tag from The Denver for $3.49. The Denver, as The Denver Dry Goods Company was known, operated some of the largest and most successful department stores in Colorado from their inception in 1876 until 1987, when the remaining stores were renamed “May-D&F” by new owners The May Company. $3.49 in 1946 was the equivalent of about $42 today — and the wedding present included an Argus camera and five more rolls of Kodachrome. Thanks for this great gift, Mike! All contents Copyright © 1996-2019 Daniel J. Schneider. All rights reserved. This material may not be copied, published, broadcast, rewritten, redistributed or manipulated without permission for any purpose.